The conventional medical ultrasound imaging has a low lateral spatial resolution, and the image quality depends on the depth of the imaging location. 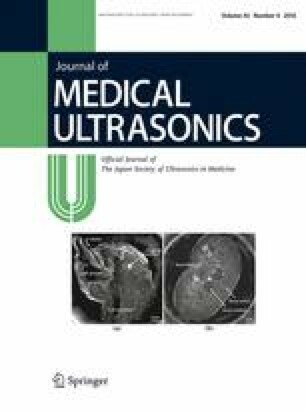 To overcome these problems, this study presents a synthetic aperture (SA) ultrasound imaging method using a ring transducer array. An experimental ring transducer array imaging system was constructed. The array was composed of 2048 transducer elements, and had a diameter of 200 mm and an inter-element pitch of 0.325 mm. The imaging object was placed in the center of the ring transducer array, which was immersed in water. SA ultrasound imaging was then employed to scan the object and reconstruct the reflection image. Both wire phantom and ex vivo experiments were conducted. The proposed method was found to be capable of producing isotropic high-resolution images of the wire phantom. In addition, preliminary ex vivo experiments using porcine organs demonstrated the ability of the method to reconstruct high-quality images without any depth dependence. The proposed ring transducer array and SA ultrasound imaging method were shown to be capable of producing isotropic high-resolution images whose quality was independent of depth. This work was supported by a Translational Systems Biology and Medicine Initiative grant from the Ministry of Education, Culture, Science and Technology of Japan. This research was also supported by the Center of Innovation Program from the Japan Science and Technology Agency, JST. There is no conflict of interest to be disclosed for this work, and the manuscript is approved by all authors for publication.